An investigation into the sale of firearms and weapons trafficking has led to the arrest of two men. The RCMP Canadian Firearms Programs (CFP) National Weapons Enforcement Support Team (NWEST) and the Brandon Police Service attended the Brandon Gun and Hobby Show on December 12 and made the bust. 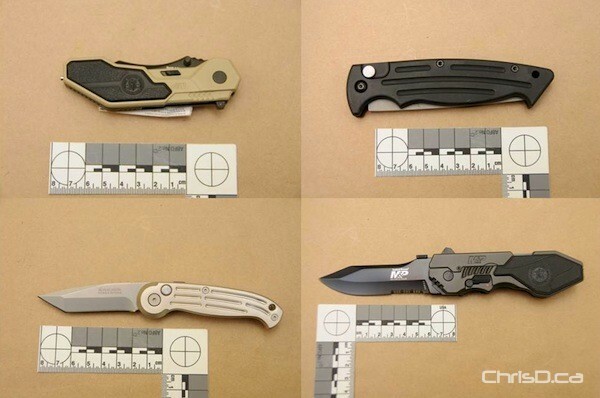 Police found the men, aged 70 and 71, to be trafficking in spring-loaded knives, which are illegal in Canada. A large quantity of firearms, knives, ammunition, and cash were seized from the two men who had reserved tables at the show. One of the two men was a licenced firearms dealer in Ontario and had illegally transported and dealt in prohibited guns within Manitoba in the past. A further investigation resulted in a search warrant being executed on a residence in Dryden on December 13. Several unsecured firearms, ammunition, prohibited devices, and a prohibited weapon were found in the home. Both men face numerous charges. No names have been released.